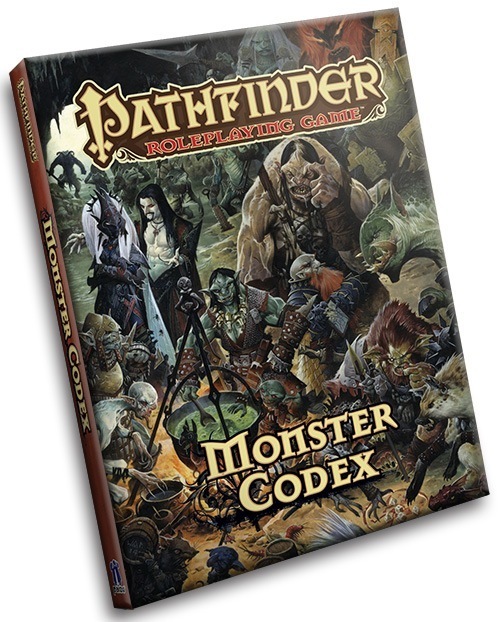 Monster Codex is a fantastic 256-page hardcover collection of new rules, variants, and background on twenty classic monstrous races for Pathfinder. The full-colour artwork inside is excellent and the book is laid out quite well. I'm not a particularly big "monster guy", but I found this book quite interesting and readable, and enjoyed finishing an entry every night before bed, often drifting off to sleep with fun (and nefarious) new ideas. Each entry is twelve pages long and includes a half-page picture and a half-page of in-universe flavour text, followed by a really well-written page of description and background that goes far beyond what's available in a Bestiary. Each monster then receives about two pages of new rules, the exact content of which varies--it could be new archetypes, magic items, spells, feats, favored class options, and more. Some of these options could be taken by anyone, but most are limited to members of the particular race. Next, each entry has six pages of full stat-blocks for variant or specialized members of the race, many of which span a range of Challenge Ratings (CRs) (often through the addition of class levels) so that particular monstrous races don't become obsolete once the PCs reach a certain level. GMs might be surprised how useful this is in expanding the options they have when designing storylines, and the entries include a good mix of martial and caster variants. After that, a new creature associated with the race is presented in a one-page stat block--these are often some sort of animal (or animal-like) companion or pet often present. Last, there's a one-page summary of a few different types of encounters (of varying CRs) in which the PCs might come into conflict with the race--note that these are not true encounters detailed in the sense of maps, terrain, etc., but more like common ways the monsters might be encountered and the number and types that they'll bring to the occasion. Since there's twenty entries, I can't go into full detail on each, so what follows is more like a list with some very brief comments of things that caught my particular attention added in. An appendix introduces the concept of "Simple Class Templates". The idea here is to allow a GM to quickly modify a monster by adding class levels without having to laboriously rebuild a stat block from the ground up. Thus, each of the Core Rulebook classes are given quick template rules and simplified spellcasting. I haven't tried this method out, so I don't know how well it works. As I said, I'm not a monster guy, so the fact that I enjoyed this book so much is telling. It really does freshen up monsters with the options presented. Long-time players, even those that do their very best not to metagame, may not be able to avoid sighing when yet another orc or troll appears in a game--but with the material presented here, the GM can add a surprising twist to every encounter. In addition, the stat blocks for higher CR versions of every monster makes many of these monsters viable opponents throughout a campaign instead of the old "goblins at Level 1, trolls at Level 5, and neither ever seen again afterwards" problem. I also liked how the addition of class levels can help turn common PC strengths against themselves--an alchemist monster hurling touch-attack area of effect bombs definitely changes up the battlefield! Although this book isn't literally indispensable for GMs, it would be among the first recommendations I would make. And, perhaps surprisingly, there's enough race-neutral options here that players will surely find something useful for their PCs as well (if they're cheeky enough to buy a copy). And you gotta love that cover! I had this exact idea and wrote it down but never sent it. Now I have owned your version for awhile and I just love it and how you executed this book. You can really tell how valuable this book is to GM's as every review is 5 out of 5 stars except 1 review dragging down the median. 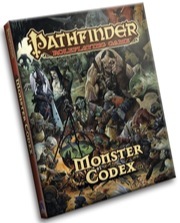 I echo the sentiments of my fellow reviewers when I ask to see a second Monster Codex and here is a list that might be good candidates. Love to hear what others ideas might be. 18 in total; 4 playable races, 8 monster races, 6 undead creatures. Other possibilities are Cloud & Storm Giants, also Suli is a real cool playable race that could be added. Finally I would also love to see a second Rival Guide but hopefully there would be more low level groups. It could be called Rival Codex and could also include a more extensive section for groups like primitive tribes, street gangs, crazed zealots, and evil monks than what is in the GMG. I really cannot praise the Monster Codex enough. In the year since its release, it has become one of the most used resources at my game table. It's like a Bestiary, the NPC Codex, and the Advanced Race Guide all rolled into one! The Monster Codex covers 20 of the most common monster races and provides a selection of NPCs for each, as well as several new rules options, and still more. It gives GMs a chance to take these classic monsters and add huge variety to them. This is really what the revisited products should be like: full of extra inspiration and details to make a GM's like easier. Why buy a product that just regurgitates what I already know about a monster race? This focuses on many of the humanoid monster races and fleshes them out, something Paizo really needed to do. I'm hoping they do this with many of the other races that are sentient. This book is well worth your money if you plan on using monsters as characters in your games and not just target practice. This is probably one of the best Pathfinder resources for DMs. I love the 'classic' monsters, but it can be hard to use them in other than their typical niches. This book takes care of that and lets orcs, kobolds, and the rest be diverse enough to keep the players guessing. This. This is wonderful idea. How do you fight the inevitable monster bloat? By dedicating a book to advancing existing monsters that everyone knows and loves! There are some interesting monster choices in that lineup; I notice quite a few player races in there as well. — Hopefully we'll see Favored Class options for all featured creatures. That would be GREAT for the PC-friendly races in the book that didn't get a full list in the Advanced Race Guide. — I'm a little bit apprehensive about the inclusion of vampires. While iconic, vamprism is usually a template, not a separate creature. As a result, this doesn't seem like a monster entry that's really worth it's salt here because there are already rules in place to build high-powered vampires. — I didn't know the boggard was iconic. — Adam must have lost the good fight: there are no flumphs in this tome. A lil disappointed no fey made the cut though. This. This is wonderful idea. How do you fight the inevitable monster bloat? Um, there is no such thing as "monster bloat" in any RPG. I for one am a bit disappointed in no Bestiary 5 but I guess we'll see what comes in 2015. Hmh. I was ready to be super-excited about this book as soon as I saw the title, but the focus on 20 specific monster types makes me considerably more ambivalent.. Hopefully the book will include new feats and options that are useful for all monsters as well (which is something I've wanted more of ever since 3.0's Savage Species), rather than only having options specific to those particular races. Hmmm... More Goblin Archetypes? Didn't the Race Guide already do that? Are these new Archetypes balanced for Player use as well? or just for GM use? Each monster includes an in-depth look at its society and ecology, new rules like feats and spells designed to compliment the race, and archetypes built to give monsters a new edge. Salvatore and his editors never got that one right, and every time Drizzt expressed how fortunate he was to find companions that "compliment" his fighting style, I always pictured him fighting something while Bruenor et al. sat around calling out, "Oh, Drizzt, you parry and thrust divinely!" Ah, interesting! I wasn't expecting a book like this to come out, but I've heard people across the forums making proposals to have a monster-options book that wasn't a bestiary. * I'm really looking forward to the ecologies section; I wonder how much of the new fluff will retcon or replace old books like Classic Monsters Revisited. * The main opposing force in my campaign is Moloch-worshipping Hobgoblins, so if my players don't wipe them out by october, they may get a chance to see some of these unique options for that race. *On that note, several of those twenty monster races are also player races. I wonder how useful a lot of these new archetypes and other content will be useful for players. Interesting. Something sort of like an idea I've considered doing for a different campaign world myself, though I'm curious as to whether the implementation will be the same here or not. Specifically, the idea I had was to essentially take some of the "base" monsters of the bestiaries and present some sample statblocks representing tribal and regional variations of same (such as differing tribes of goblins, etc). Presumably, this will be world neutral (as opposed to campaign oriented, as my idea is and a Codex of Golarion, for instance, would be), but I wonder if the premise is roughly the same? It's hard to get a precise feel from the description. Idea is great, saves some time and looks interesting! Already getting my hopes up for this one! Apart from the new rules, it seems many of these 'ecologies' have been printed before in either the Campaign Setting line or in the Adventure Path line (at least 75%). Is there sustantial new material concerning the background information of these monsters? This is very cool and I am looking forward to it, but some of the choices make me scratch my head. Boggards and Ratfolk? Really? I'm sure they will be well done, I just cannot see either one as being on the same level as the others listed, who are definitely among the most iconic humanoid-ish* creatures in the game. *-- no dragons, outsiders, or fey, and the undead are explicitly former humanoids. ...I hate to be the negative nelly, but this is giving me screaming flashbacks to 3.5's MM 4 and 5, which absolutely none of the gamers in my group liked, and which turned out to be the harbingers of 4th Edition. I like Bestiaries too, but when Drop Bears are being considered as a viable monster entry, I think we've got some troubles. Plus considering the number of popular PC-friendly races that are going to be spotlighted in the Monster Codex, this book makes a lot of sense for publication. It could potentially attract players who enjoy playing goblins, orcs, ratfolk (which seem pretty popular in their own way), drow, and duergar. A Bestiary only attracts GMs. Going forward, this could be a good way to spotlight other Advanced Race Guide races without creating an Advanced Race Guide II so to speak. Also, if the racial Archetypes in this book are going to be exclusive to their race, I'm hoping that the designers and developers make them more like the Caravan Sniper drow fighter archetype or the Ouat dwarf monk archetype (Inner Sea Combat). Racial classes are frustrating if the mechanics do not directly support the racial restriction by interfacing with aspects of the race that other creatures can't copy. To be honest I'd have preferred to see the Advanced Class NPC Codex, higher level Magi, Alchemists and Summoners are pretty tricky to create quickly. This might be the first hard cover I skip, or wait before buying because I can slap racial abilities on any stat-block in the NPC Codex. I'd guess they're updating some of the information for Classic Monsters Revisited and Classic Horrors Revisited. Also, I'm amused by the vampire hitting on the drow. So, this means we will have a lots of humanoid fights in the near future that will need this book ? Hmmmm, maybe a Belkzen Adventure Path ? I have mixed feelings about this one, on one hand I like monsters getting some interesting options but on the other hand it is too specialized and many creatures I would like to see are not there. We get ratfolk but no catfolk, no fey, no hags, no centaurs, no medusa, no lamia:( I really would love to see stuff for nixies, pixies, centaurs, lamia, minotaurs, medusa, etc. and maybe someday we will. I get that most of these monsters are iconic but ratfolk , really! Well this is more interesting then another NPC codex. But does this mean that we will have to wait even longer for a bestiary 5 because we might get this line of books with NPC codex books. Is this the hardcover equivalent to the "... Revisited" books? Because if it is, I'm looking forward to it! Does placing this the "Roleplaying Game" line mean, the descriptions aren't Golarion specific? I can finally play my vampire with some magic item/feat support. As it is my ring of Permanent Prenumbra is the only thing that lets me function in the party. I'm excited for the fact that this is showing more diversity towards pc-monster races, which is something that I always love to see more of a la savage species. Not really like I would some months ago, now I have my own project game and Diablo 3 to keep me going. But still disappoined to see this instead of Bestiary 5, better would be this + Bestiary 5. What I don't understand is why Ratfolk, robots and Flumph's are probably accepted by you, but a Drop Bear would be too much? It's not clear to me what itch this is scratching. If I want monsters, I have the Bestiaries. If I want to customize monsters, I can add class levels and use the feats available to PCs. If I want ecologies, I can go to the Pathfinder "Revisited" line. If I want the option of having monsters as PCs, I can use the Advanced Race Guide. What am I not "getting" here? Maybe if some specific examples are elaborated, I could see the usefulness of this. They are ready. And after that they will be published in the SRD and Paizo can gain space in adventures simply linking to their online stats. Hmmm, I'm not sure how I feel about this one. The stat blocks I think are really pointless, but maybe some of the feats and archtypes could be nice. Overall I'm kinda glad there's no bestiary 5 but also am not enthusiastic about this replacement. Also, I think this is a great idea for a book. I'm looking forward to it. if every single one of these is getting at least one racial archetype, then im probably buying them. Tell me we are getting an official huge and larger monk unarmed strike progression, that would guarantee my purchase. This is a totally awesome idea, hopefully Paizo can really make it sing. Also, Joana is my messageboard hero! Seems like a natural extension of the NPC Codex... even though I was lukewarm about that book at its announcement this one has me intrigued. From a GM perspective, more simple templates are always welcome additions to the game! Looks good but do we need more goblin stuff? Looks good we need more goblin stuff! I think I'm just one of those crazy Paizo fangirls who gets excited about everything. This? Advanced Class Guide? Numeria? Mummy's Mask? Traditional fantasy? Crazy out-there stuff? I love it all. I think I'm cool with that. There are already rules for making high-power orcs and goblins, too. Just like with vampires, they're called class levels. A GM could have made any stat block in the NPC Codex from existing rules, but it saved them the trouble. Maybe this is the same? They die off so fast you always need more goblin stuff to compensate. Choosing which monsters we wanted to highlight in this book was actually a tough decision, especially since we knew we had a limited number of "slots" available. Several of us (me, Erik, Jason, Wes, and a few others) more or less worked together to build the final list, and the mix is a result of monsters that are obvious choices, monsters that need more love, and monsters that one of us really likes and wants to see more about. Combined with that, we wanted to pick monsters that were pretty human shaped and that had societies but also have a wide range of monster types. We have lots of reasons why we chose the ones we didn't and more to explain why we chose the ones we did... but more to the point, if this book ends up being popular and folks like it, there can certainly be more in the line eventually that touch upon other races. And while there are some options in there for some zero HD races... and thus in theory they could be utilized by player characters... this book is very much one that's aimed more toward GMs, akin to the NPC codex or a Bestiary. Because we already did the player focused race book—Advanced Race Guide. I am intrigued by this book. I assumed we would get an NPC codex, but was predicting it would be one that covered the classes not covered in the first one. Presumably the idea here is to have a ton of thematically appropriate statted NPCs for major enemy races. Yes...I can make them myself, but I am lazy, and I would rather just have someone do the work for me.